Make a bold statement in these classic and sophisticated chic pinstripe shorts. 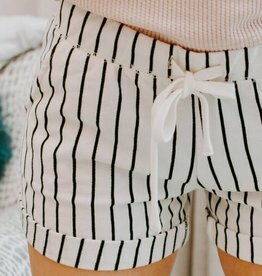 Featuring a pinstripe boyfriend short, enclosed elastic waistband with drawcord tie closure at the front, roll cuffed bottom hems, side pockets, and relaxed fit. Sorry belt collection, this one's taken. The Belt It Out short is a relaxed fit rayon twill paper bag waist short with a tie waist belt.